There's a reason why people return to buy our unforgettable cheesecakes for every occasion. This secret cheesecake recipe fits the bill for any person with a craving for something sweet. It all starts out with a thick graham cracker crust. There's plenty of it for the people who call the crust their favorite part of this traditional New York-style dessert. Keeping up with this popular and classic recipe, the Raspberry Cheesecake is made with fresh ingredients like cream cheese, eggs, sour cream and a hint of lemon that gives the perfect boost of flavor. If that's not enough, just the right amount of raspberry fruit filling is hand swirled right into the classic New York-style cheesecake batter. 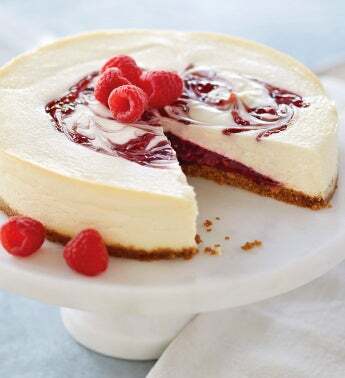 It's silky, smooth and everything you could ever want in a gourmet cheesecake.